The Studio at SCA is Southern Cross Austereo’s commercial creative services unit. Our prime focus is creating ‘Audio That Moves People’ - audio that moves people to listen, to participate, to feel and to act. The Studio at SCA has launched BRANDSOUND; a unique methodology that creates distinctive audio assets that helps to build brands. With audio consumption on the increase coupled with the adoption of voice activated technologies, brands need to have a distinct and memorable audio identity or risk being left behind in a world where the path to purchase is as simple as asking for it – will they ask for your brand? We’ve partnered exclusively with Veritonic - the world’s only audio benchmarking and research company, to be able to replicate your brand’s values exactly through sound, preparing your brand for an audio connected future. 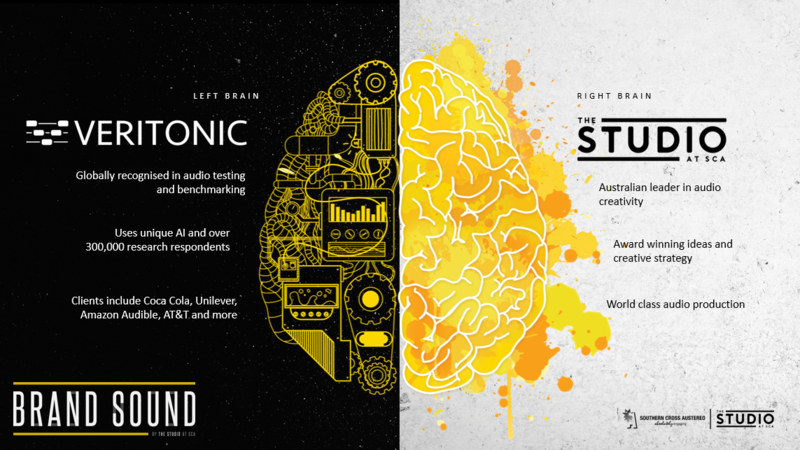 Its global audio benchmarking meets world-class creativity exclusive to The Studio at Southern Cross Austereo. Contact your SCA Representative now to learn more. WHAT'S NEW IN THE WORLD OF AUDIO? The Studio at SCA increased sales for Selley’s by 44% by getting Youthful Tradies talking about a product, that is typically forgetful, this is how we did it. 30 years later the SPC jingle gets a refresh from the team at The Studio.